Crown Princess Victoria and the Minister for Trade, Ewa Björling make a joint promotion trip to Ghana and Tanzania on 17 - 21 March. The visit aims to further deepen bilateral relations with Ghana and Tanzania and to increase trade with the two countries. Special focus will be on young entrepreneurship. The Crown Princess and the Minister will the President and the Minister of Commerce in each country. On the 19th to 21th of March The Swedish Crown Princess Victoria and the Swedish Minister for Trade Ewa Björling are visiting Dar es Salaam. 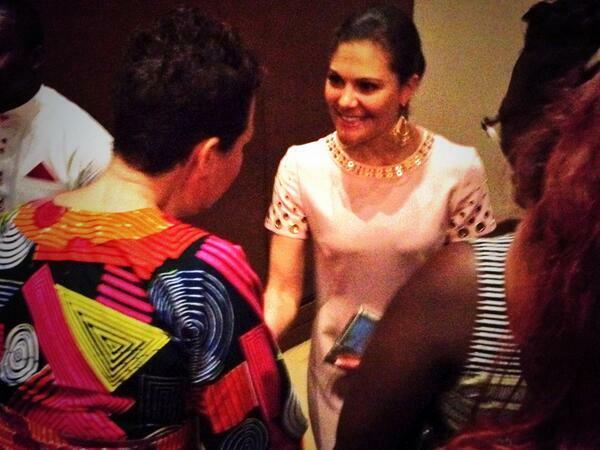 It is the first visit to Dar es Salaam for The Crown Princess and the second visit for The Minister for Trade. MTV quotes Expressen's article, this is the first long trip to Victoria after Estelle was born when she is away from her daughter. Victoria returns from the trip on Saturday. During her trip Victoria visits the slum areas in Ghana, meets ministers and representatives of charity organisations. This trip is same kind of promotional trip with the Minister for Trade as Victoria's and Daniel's two-day visits to London and Germany. Since it is a long trip, they have decided that only Victoria goes and Daniel stays with Estelle. WaterAid's patron Victoria and minister Björling visit Dar es Salaam and Kigamboni to see what difference WaterAid's work makes and to meet people who have got better living with clean water and hygiene. On Saturday 22nd March is the World Water Day. 768 million people in the world have lack of clean water. Victoria and Swedish Minister for Trade Ewa Björling were welcomed to Ghana by Ghanaian Minister of Health Mrs Hanny-Sherry Ayitey and Ambassador Kilander. Thanks LadyFinn for all the Information and pics from the first day in Ghana! Round table with Swedish firms in Ghana, concluded the first day of visit of Crown Princess Victoria and Minister Björling to Ghana. Short video from the welcome ceremony and photos from Svensk Damtidning. From the airport Victoria and the minister went to visit a slum where a training project for young girls is going on in a half-finished mosque. In Accra was 29 degrees Celsius. Photos from yesterday. Victoria's and the minister's government plane was 1,5 hours late because of the bad weather in Sweden. The plan was that they would go to the hotel first, but Victoria changed the plans and they went straight to the slum visit so that the girls didn't have to wait for them. Today Victoria visits TV-channel Viasat and charity organisations, plants a tree, has lunch with the president of Ghana and attends a business dinner. To many girls this visit was a fulfillment of a dream. 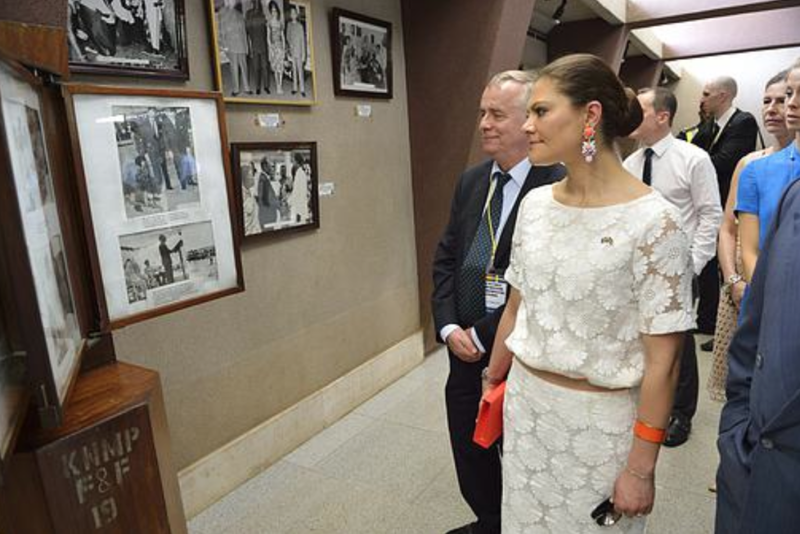 Victoria visited KAIPTC, Kofi Annan Peacekeeping Training Center in Accra. Victoria and minister Björling flew a six hour flight with the government plane to Ghana and they had a lot of time to talk with eachother. The minister was with Victoria and Daniel also in London and in Germany. - The Crown Princess is not only very well-read. She is also genuinely interested in the various topics we discuss. 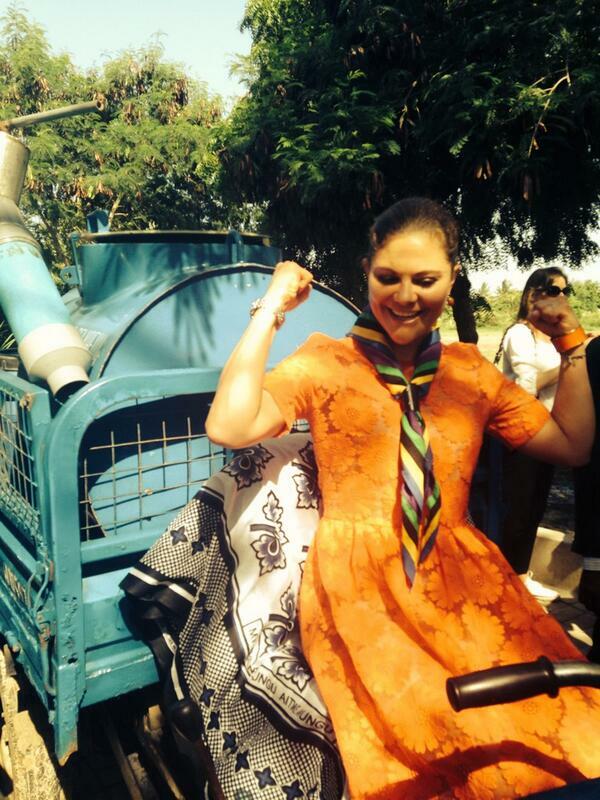 Also Crown Princess Victoria seems to be impressed of traveling with the Minister for Trade. In Ghana, Victoria repeatedly at various official meetings presented Ewa Björling as "our Minister for Trade, whom we are very proud of." 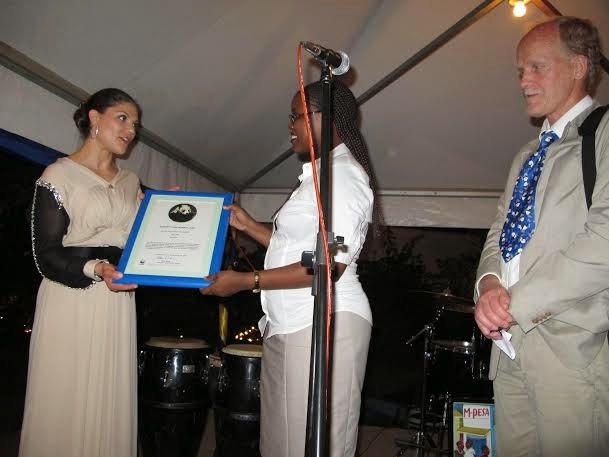 Final rating of that Victoria and Ewa have actually become real friends, buddies or girlfriends as the Crown Princess herself would put it, was clear at the Kofi Annan International Peace Training Center. - We are grateful and impressed by your visit and this you shall bear in the future to remember, said Major General and gave Victoria and minister Björling a shawl with Kofi Annan's emblem. - How should I wear it? After a bit of guidance was the shawl on and Victoria quickly helped Ewa Björling. - Oh, how nice. Now we are quite similar. Now we look like sisters! noted Victoria and got new best friend to agree with a laugh. On Wednesday they fly from Ghana to Tanzania and in the evening there will be a reception at the Ambassador's residence in Dar es Salaam. On Thursday they meet the president of Tanzania and the Foreign and Trade Ministers. In the afternoon they visit the WaterAid project. In the evening is a reception at the Swedish Residence. 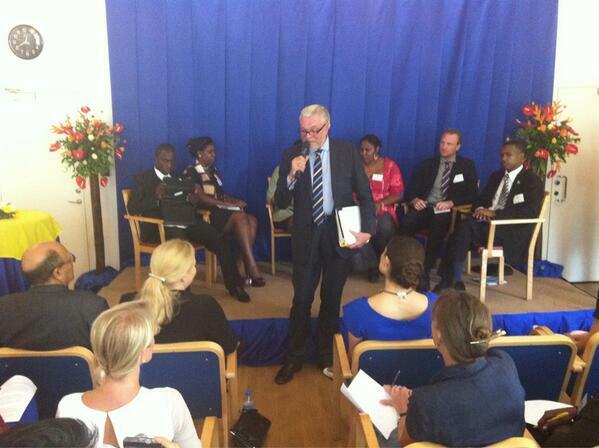 Swedish and Tanzanian companies are invited. On Friday morning they visit a hospital in Masaki, which provides care to people with disabilities. Then they meet the Interior Minister and the Minister for Natural Resources. Progress and examples of stopping illegal trafficking of animals are the day's topics. The rest of the day goes to seminar on young entrepreneurship. Local organizations Femina Hip and Restless Development work with the help of Swedish support to help young people in the country to start a business. In the evening they start their flight home. Victoria at a dinner on Tuesday evening, photo from the Twitter of the Norwegian ambassador. 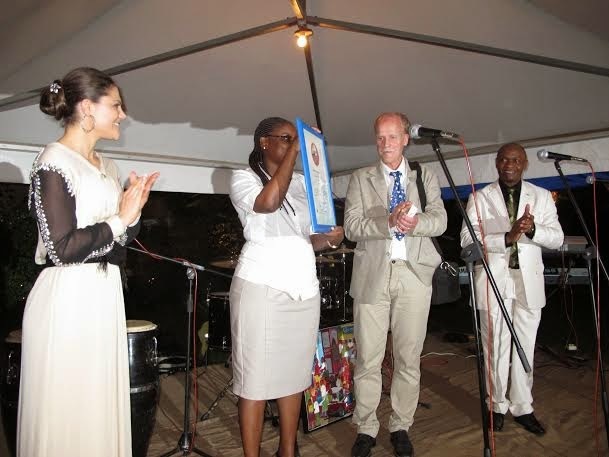 Agreement between the Swedish company Scania and the Ghanaian Ministry of Transport finalised and signed in the presence of Crown Princess Victoria and Trade Minister Björling. Scania is to supply 300 buses, equipment, services and operational support for Accra's Bus Rapid Transit System. During a promotion trip in Ghana which the Crown Princess and the Minister for Trade jointly implement this week wrote Scania and Ghana a business that involves the sale of 300 buses with accessories to the country. Victoria visited on Tuesday also Kwame Nkrumah Memorial Park in Accra where the life of Kwame Nkrumah, the first president of Ghana, is shown at a museum. President John Dramani Mahama is seeking the support of Sweden to develop Ghana's renewable energy resources. At a meeting with the Crown Princess of Sweden, Princess Victoria, at the presidential villa at the Akosombo Hydro Electric project site yesterday, Mr Mahama noted Sweden's tremendous capacity in renewable energy generation and expressed the hope that it would partner Ghana in that respect. 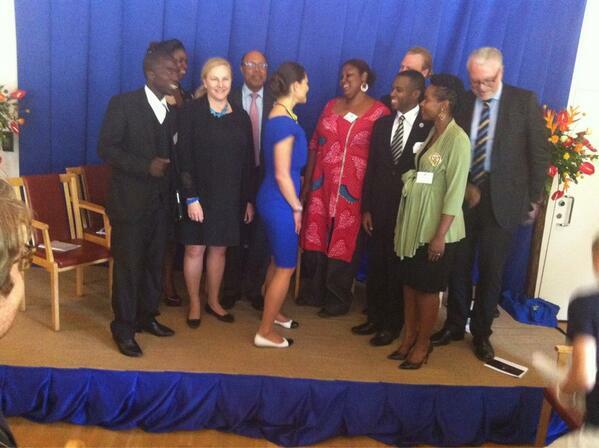 Responding, Princess Victoria said Sweden was proud to be a partner in Ghana's development process. Victoria met people from Tonaton.com, the largest marketplace in Ghana. Victoria and minister Björling have arrived to Tanzania and Dar es Salaam. Victoria met Jakaya Mrisho Kikwete, the president of Tanzania. Arriving to a reception at the swedish embassy. Video of the arrival to Tanzania, meeting the president and going to the reception. The swedish ambassador says that Victoria's visit is very important for Sweden and Tanzania. The countries have good relations and this visit gives Sweden more coverage in Tanzania, it has a big symbolic value and the visit has raised a big interest. Johan T Lindwall tells that Tanzania's president was on a good mood and said to Victoria that she arrived with big rain which is a good thing. Rain means happiness and success in Tanzania. Karibu Tanzania mwana Mfalme wa Sweden. Victoria visited WaterAid Sweden in Tanzania and got information about how they work to improve people's lives with safe water, hygiene and sanitation. Victoria met on Wednesday also Bernard Membe, the Minister for Foreign Affairs. On Thursday morning, arriving to a meeting with Tanzanian ministers. Victoria visited also a school. Video of the visit to WaterAid. Johan T Lindwall told that he asked Victoria if she uses Skype to talk with Daniel and Estelle on this long trip. Victoria had said that she hadn't done it yet, but she talks often on the phone with Daniel and Estelle. Victoria said also that there is always a lot of work to do before the trip, she reads and learns a lot of the countries she visits. Victoria said that this trip has been very successful. Lindwall told to Victoria that he met the Tanzanian president after Victoria had met him, and the president had praised Victoria very much. Victoria became a little embarrassed and said that it was friendly said from the president, but that she is just doing her job. On Friday morning Victoria visited a hospital CCBRT (Comprehensive Community Based Rehabilitation in Tanzania), that works to increase awareness and give free surgery for women suffering from fistula, a severe birth injury which women are not only at risk of losing their children, but also lose the ability to retain urine and feces. A new maternity care department is being built with the help of Sweden. Video from the visit to WaterAid and Kigamboni, Victoria was welcomed by singing children. On Friday Victoria had also a luncheon discussion with the Minister of Natural Resources, Lazaro Nyalandu and Interior Minister Mathias Chikawe, they discussed the efforts to stop illegal animal trade. Video of Victoria's last day, Friday and an interview of the Minister for Trade, Ewa Björling. - The fact that we have a monarchy in a democracy is quite unique and we see ourselves during this trip how incredibly much attention Crown Princess gets and it is of course the very best for our Sweden image.